Temptation is everywhere as we navigate life in constant pursuit of more happiness. Our world is like a massive wall of neon signs. We see all these messages that shout out: buy me; you must have me; I’m the answer . . .
Do material things enhance your overall well-being and bring you more happiness? By design, we’re curious about what we can get next. Shiny trinkets for our wrists and fingers; fun toys that will let us feel like we’re moving as fast as lightning; and let’s not forget the gizmos, gadgets, and adventures that everyone’s having. Naturally, we’re drawn to these things, but do we ever stop and consider if we can really afford the buy-in to have them? A lot of times, we don’t. “Stuff” costs money, and not just dollars and credit card bills. It can also cost us emotional currency, because we may start to see what we own as more valuable than the people in our lives. This is where people become vulnerable to losing their happiness. It’s time to slow down those constant desires to buy “things” and start to invest in yourself and your relationships. There are a million things to experience in this world, and they don’t have to clutter your closet, occupy your garage, or be stacked up on your end table with a ring of dust around them. Here are 3 reasons why less can lead to more happiness. 1. Spending money can lead to stress. And less stress can lead to more happiness. Few things can zap joy away like knowing that all the money you earn is going toward what you already own. Financial woes are a serious problem for many people and the cause of personally distressing situations. By discovering the feeling of happiness that’s not attached to “stuff,” you’ll start to consciously decide if something is worth saving up for and buying. And in the process, you’ll find a way to enjoy the journey to the purchase. 2. When you’re less obligated to stuff, you have more time to experience life. Mostly, what we own needs some sort of attention. Cars and homes require maintenance, and there are costs associated with them that go beyond that. Even small trinkets, gadgets, and appliances can distract a person. Have you ever gone into your closet and stared at all the stacks of stuff in there, hoping to easily find one small thing you need? It can take 10 minutes or more. If this seems familiar to you, you may have a problem. If you remember that happy people tend not to prefer temporary pleasures over long-term, sustainable well-being, and happiness, it can help. Next time you’re going to buy something “just because,” stop and think about it from a happiness perspective. How will it add to your life? Then make your decision. 3. Happy people are aware that happiness comes from what’s generated inside, not in their outside environment. Once you experience what it is like to live a life knowing that generating more happiness is an inside job, you’ll never want to go back to the artificial “happy” that comes from “stuff.” Through a lens of appreciation for what you have in your life, you’re best able to make assessments on physical objects more impartially. You’ll more readily accept that if they’re not a good addition to your lifestyle, they’re not necessary. This type of thought process can become intuitive over time. If you still are hesitant about parting ways with stuff, take a moment to think about children. They are a great example of how stuff isn’t necessarily exciting. They are at their best when they are using their imagination to create their outcomes. If they want to be a pirate, a stick in the yard is every bit as suitable as a fancy, flashing pirate sword from a store. This type of simplicity is quite beautiful, and it’s meant for adults to enjoy, as well. 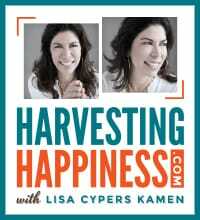 If you’re ready to break on through to conditioning your brain for happiness so you can create your own happiness revolution, have a listen to the Harvesting Happiness Talk Radio episode where I talk with Michelle Gielan (national CBS News anchor turned positive psychology researcher is the Founder of the Institute for Applied Positive Research) and Rick Hanson, Ph.D. (neuropsychologist and author of Hardwiring Happiness: The New Brain Science of Contentment, Calm, and Confidence, Buddha’s Brain: The Practical Neuroscience of Happiness, Love, and Wisdom, and more). During the podcast episode, the experts discuss how to make room for more happiness in your life.